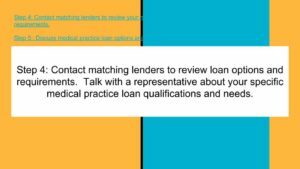 Dental practice loans available to assist your practice same day or net day with any financing needs. Easy application and closing. A dental practice can also get working capital against the the sales of the practice. Low credit scores below 500, tax liens, and existing cash advances can be approved. Fast approval. 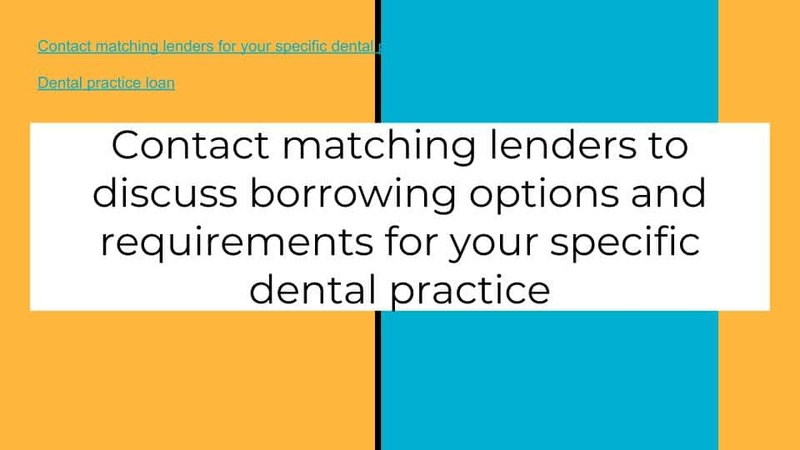 This loan against dental practice sales can obtain significant funding amounts. Just use the existing sales your dental practices already has to qualify. Almost all practices should be able to obtain funding through this program. Complete the Secure DocuSign 30 Second Dental Practice Loan Application now. 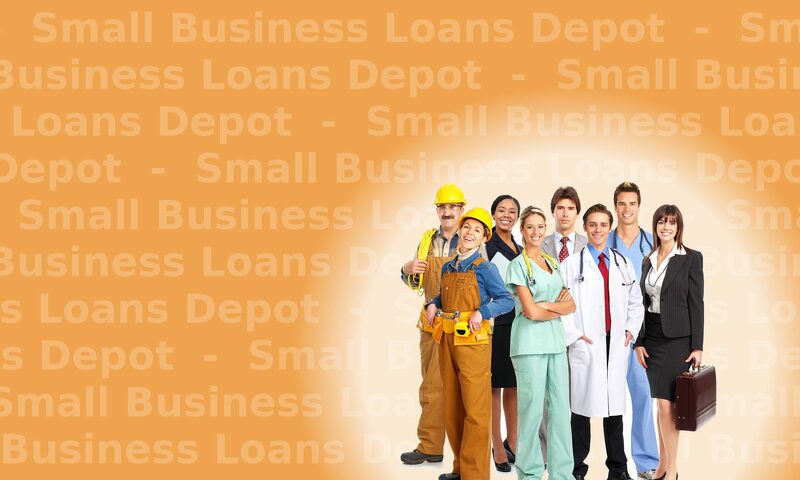 Step 1 Find lenders online that specialize in dental practice loans. 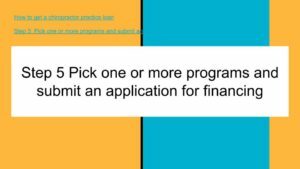 Review the program features and benefits including ease and speed of the application process and closing. Step 2 Practices that have been operating for 1 year or longer can qualify for better programs. 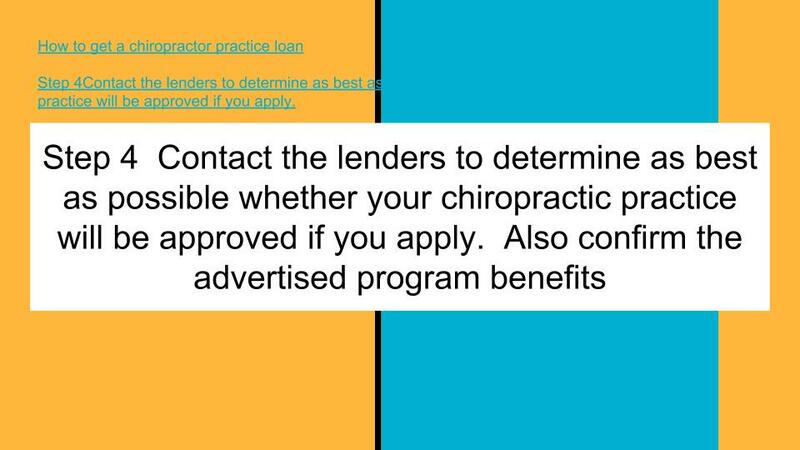 Some dental practice loan programs offer approvals with as little as 3 months time of operation. 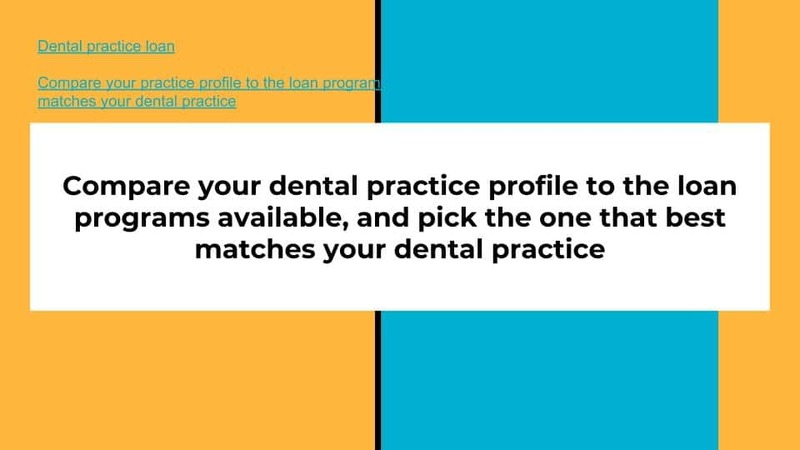 Step 3 Compare your dental practice profile to the loan programs available, and pick the one that best matches your dental practice. 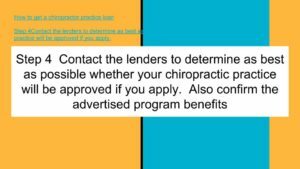 For larger practice loans over $500,000 and above, a financial package that includes 2 years business returns and interim financial statements may be requested. 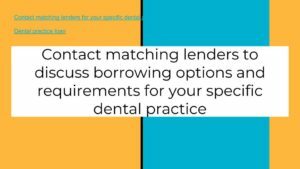 Step 4 Contact matching lenders to discuss borrowing options and requirements for your specific dental practice. 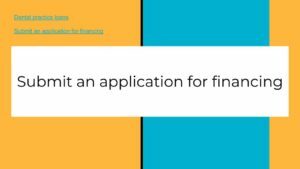 Step 5 Submit an application for financing. 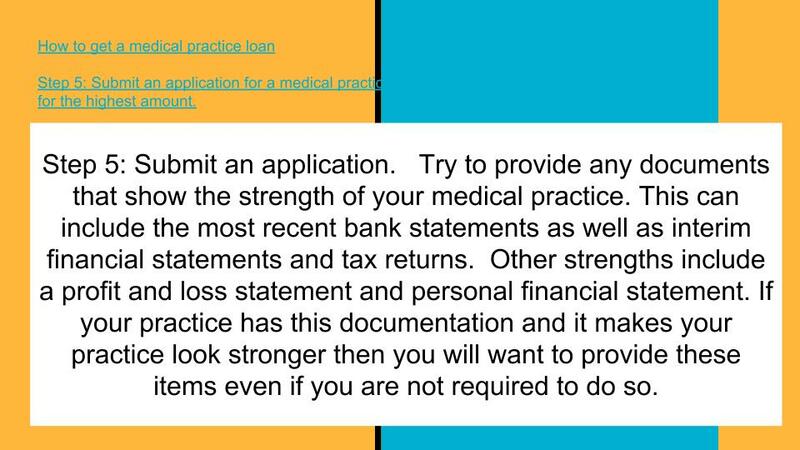 Furnish any other documents that show the strength of your practice. Step 6 For any approval you receive, review the term sheet which includes conditions and closing requirements. 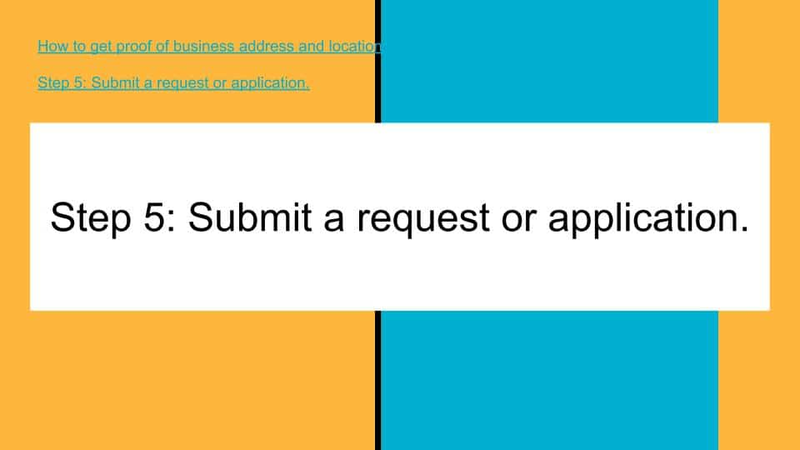 Submit items required for closing and funding. Complete the transaction and receive funding into your practice account. No application fees or upfront fees. 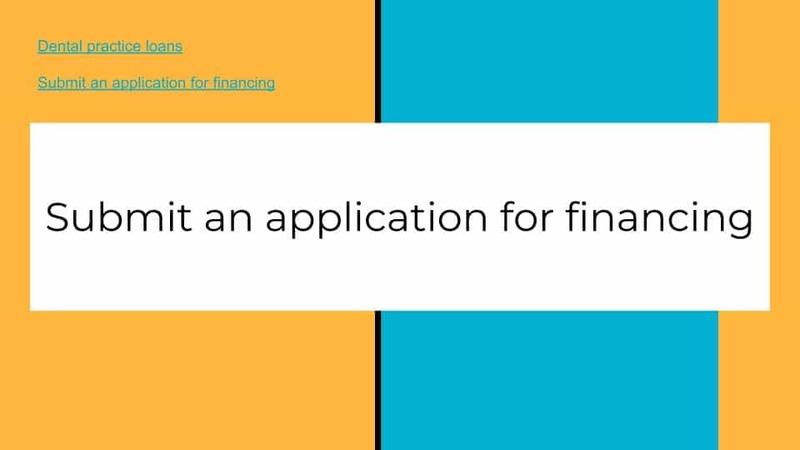 The financing process generally takes 2 to 5 business days. If a Dentistry Practice is profitable and has equipment assets, it is to the Practice’s benefit to use the equity in their equipment for other business needs, rather than to leave the equity in the equipment. For this program based on the gross sales of the business, the funding is based primarily on the most recent cash flow of the business. 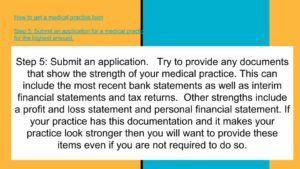 The dental practice provides a one page application and the most recent 3 months complete business checking accounts statements. Credit is only a minor factor for this program. Credit bureau scores of 500 and higher are acceptable under this program. In some cases, scores lower than 500 may be accepted. Once the statement are received, the main numbers that are looked at for each month are the average daily balance, the total dollar amount in deposits per month, the number of deposits per month. The beginning and ending balances are reviewed however they are not main considerations in the review. 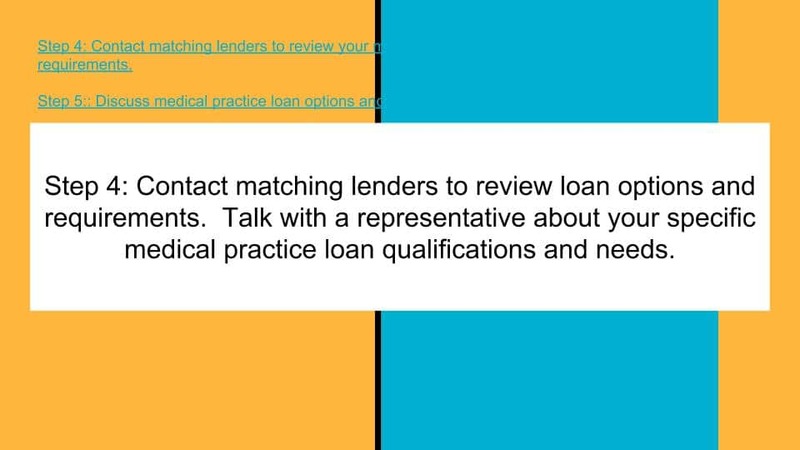 Question: I need a fast dental practice loan. How long does the entire process take? Answer: The entire process takes approximately four to six days from start to finish. 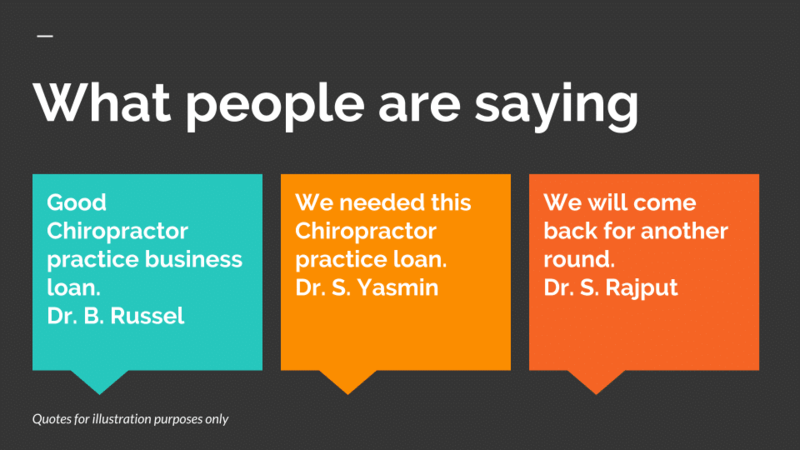 Funds are wired into the practice business account the same day as closing. 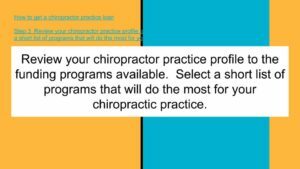 Question: What is the maximum our practice can qualify for? Answer: The maximum amount depends primarily upon the cash flow of the practice as well as time in business and the credit of the owners. Other factors include average balances in the bank account and time in business. Question: My credit score is very low. How much will it affect this? Getting your dental practice approved depends mostly on the cash flow of the practice. The credit is not as important. Credit score below 600 can still get financing. If the credit scores are higher than longer terms and better rates will be offered. Good financial statements and tax return can help even more if you have them available. Will we be declined we say our dental practice needs money to pay taxes and meet payroll? 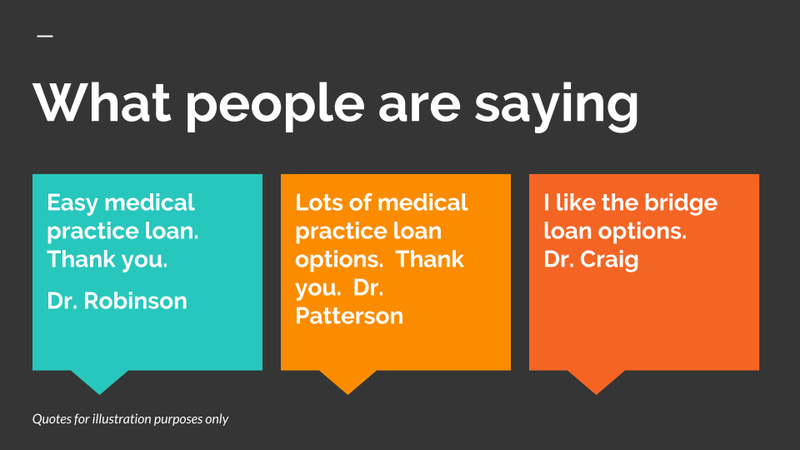 Needing a loan for taxes is not considered negative. 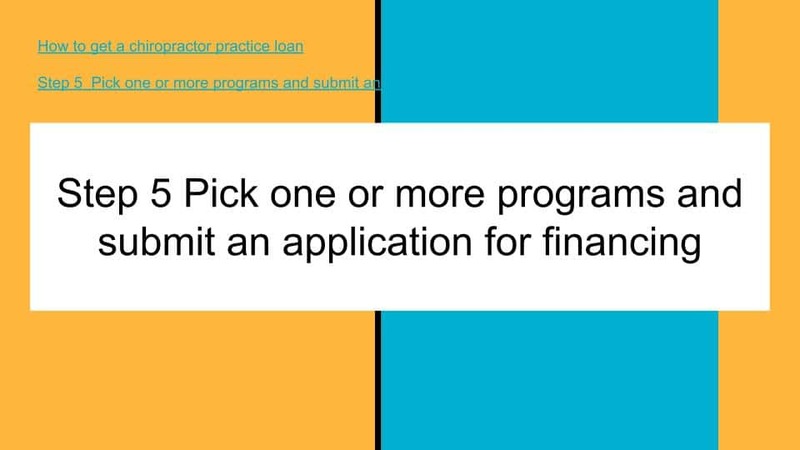 The best programs with the lowest rates may not approve a practice loan to pay taxes. 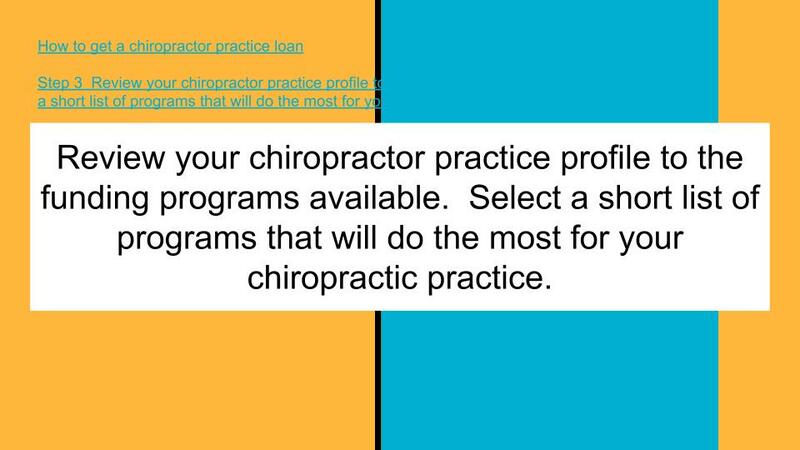 If your practice needs money for payroll or taxes then an alternative program with more aggressive rates will be better because your practice will more likely be approved and for a higher amount. 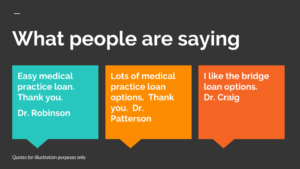 Our practice has frequent borrowing needs. What if we are approved and then realize we need more funding? Can we get an loc line of credit? Question: Can we pay it off early and get a discount? Answer: This will depend on when you pay it off and how your repayment history has been until the time you paid it off. If the repayment record is clean then a discount is normally offered. The discount normally is up to 5% to 10% off the total of the payment. The following video provides further general information on dental practice financing. 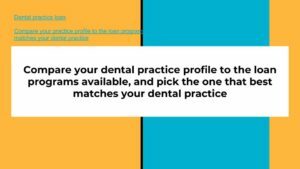 This includes features and benefits such as using the practice’s existing equipment, the $10,000 to $125,000 ranges, time frames to funding, ease of application, how the program can be combined with other funding programs if the dentist wants to get more funding. Thank your for visiting our resource page. The SBA offers assistance for business plans and financial statements.